My first broadcasting experience came in 1994. The previous year, I had met Stephen Pattinson, now sadly missed, whilst Steve was researching a BBC Radio 2 programme on Michael Holliday. “I want to put you on the radio”, Steve said, and soon I was writing a presenting two series of programmes, With Vocal Refrain and Ken Crossland’s Songbook, for the fledgling community radio station in Wolverhampton, Challenge FM. 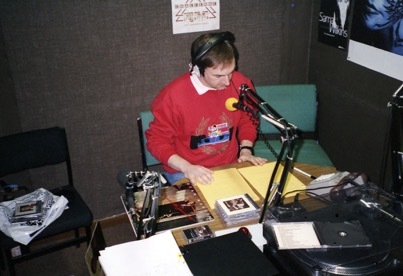 Challenge was on the air intermittently for several years, and that led to other appearances, most regularly on BBC Shropshire’s Friday night programme The Record Collectors, with Michael Adams and the late Chris Savory. Mike and Chris were primarily rock and pop focussed but it was nice to turn up now and then and offer some rarities by Bing, Perry and of course, Michael Holliday. After the publication of of The Man Who Would Be Bing in 2004, I was busy on a host of BBC local stations, including Mike Casey’s Memorable Melodies on BBC Radio Derby and Spencer Leigh’s On the Beat on Radio Merseyside, although my most prominent appearance was on BBC Radio 2 as the guest of Russell Davies on his Sunday afternoon “Song Show” programme. Other contracts followed, including some work with Saga FM in Birmingham, and appearances on “Bing Crosby - The Greatest of Them All?” on BBC Radio 2 and “For One Night Only - 50 Years of Bing” on BBC Radio 4.